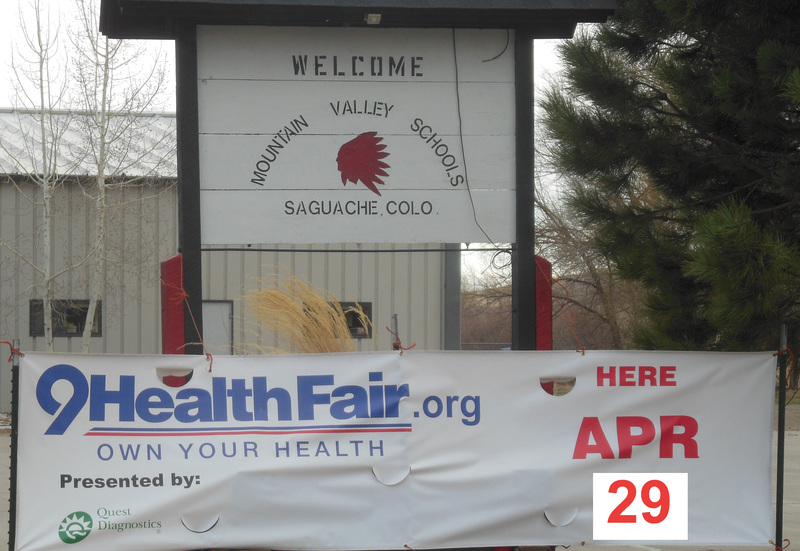 This Saturday, April 6 the Saguache 9Health Fair will be held from 7:30 a.m. – 12 noon at Mountain Valley School located at 403 Pitkin Avenue in Saguache. It’s 9Health Fair time! Basic screenings offered at all 9Health Fair locations include the blood chemistry and analysis which screens cholesterol and triglycerides, glucose levels thyroid (TSH), kidney and liver function and more. The cost of the basic screening is $35. During the blood analysis, men 40 and older can request a prostatic specific antigen (PSA) screening for $35. A $25 blood cell count screening which checks how well the body is fighting infection, and a $30 colon cancer screening kit which checks for colon cancer are also available. Fasting for the blood test is NOT required. Other optional screenings will be offered. The health screenings offered at the 9Health Fair give you the knowledge and tools to make your health a priority in a fast friendly environment for the whole family. Get professional and comprehensive blood screenings as well as access to medical professionals to answer all your questions. This year they are offering NEW screenings – hs-CRP (for heart health) and Blood Type. Register online now to make the commitment to your health! Make plans to stop into the 9Health Fair in Saguache this Saturday! Over the last four decades, more than 2 million lives in Colorado have been impacted by the 9Health Fair. What started in 1980 as an innovative way to give people access to lab tests is just as valuable today. As health care costs and confusion rise, 9Health Fairs remain affordable, accessible and convenient. In 1979 it was a very innovative idea to offer lab tests direct to the consumer. Physician John F. Brensike, with the National Institute of Health, was traveling the country in the late 1970s when he observed a high-level of interest for health screening services. He noted very few screenings were available and the quality varied. More importantly, there was no mechanism to provide health education and medical follow-up to the community. Dr. Brensike was passionate about promoting preventative health maintenance. He established the National Health Screening Council for Volunteer Organizations (NHSCVO). Through this organization, the health fair concept was born and presented to interested communities across the nation. In Colorado, the president of KBTV Channel 9 (currently 9NEWS) recognized the value to the community. 9NEWS provided financial and media support to launch the first 9Health Fair. In the first year, there were 40 different fairs and 55,000 people attended. In the second year, the number of 9Health Fair sites more than tripled to 150. It’s estimated that $8 million of free health screenings were provided in 1981. If you have a critical or alert out-of-range value in your lab results, you will get a call within 24-72 hours from a 9Health medical volunteer. 9Health medical professionals will recommend what follow-up care to seek out, and help you find resources if you don’t already have a primary care physician. Today, 9Health is developing a complete prevention program that gives you education, tools, and motivation to take health-positive steps every day.